A murdered society debutante, her body sprinkled with 89 Costa Rican butterflies. A headless, gutted corpse washed up on shore with a beautiful, dead teenager. The case is anything but straightforward, and in an uncertain future, where resources are limited and the genetically defective are banished to a ghetto territory for Impures, Chief Detective Ina Stone and her partner, rookie detective Sam Fujimoto, must cross into Pure Territory to find a killer. An Impure herself, Ina must overcome her defect. And when her life is threatened, she must learn to rely on Sam, whose interest in her seems more than just professional. Liah Penn is an author and attorney who resides outside of New Orleans, Louisiana with her husband and two sons. A former prosecutor, she has worked on an Indian reservation, on the Mexican border and as a small town lawyer. 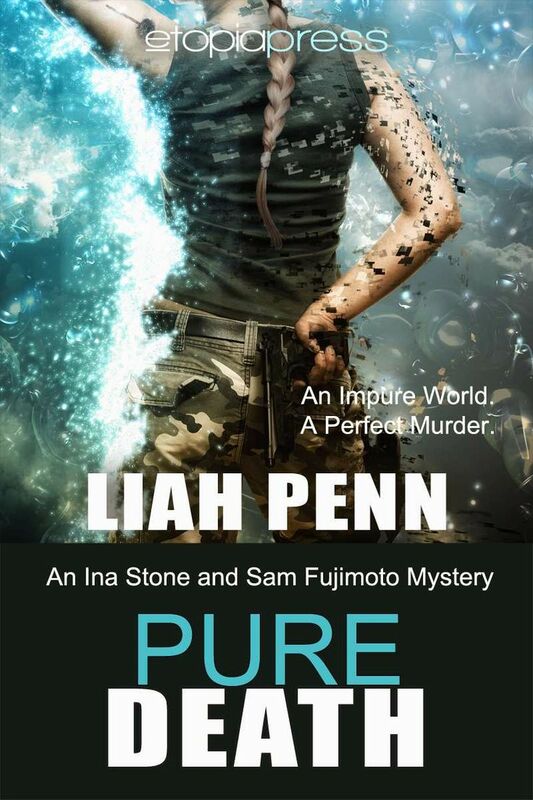 She is hard at work on the second book in the Ina Stone and Sam Fujimoto mystery, “Pure Justice”. I had been born Pure, just after the War, a perfect baby, with blonde hair, blue eyes, and parents who tested in the top one percent of the intelligence quotient. But I wasn’t perfect. When I was pulled from my mother’s womb my left hand was withered, damaged, and bent. Now, as I walked home, I pulled the defective hand out of my pocket and left it out. Just in case. IP Territory was a dangerous place to live. The rain had stopped by the time I left the bar, so as I navigated the oily streets, my ears were alert for signs of trouble. It was nearly two o’clock in the morning. The mist hung in sheets and my hair was beaded with pearls of moisture like spider’s eggs on a black widow’s web. I could feel the damp and cold seeping into my bones. I recalled the glistening of body fluids under the decomposed body, oozing from the flesh as it fell like parchment from the sinewy muscle and bones. I stopped in my tracks and thought. Was the ground under the body dry? No, it was wet. But not just from the body fluids. No blood. We saw that. But the dirt, not dry. Moist. Black, silty Mississippi river mud. Had the body been placed after it had started raining? Or had it washed up on shore? Was that what Melker meant when he said the person hadn’t died there? I felt the evidence bag in my pocket. I’d have to log it in on Monday. I walked on, the street lamps casting an amber hue, burnishing the decaying buildings with its light. Oil on the streets weeped into puddles creating rainbows in the grime. The shiny pen-like object on the chain. Why wasn’t it dirty and oily? Or had it been washed clean by the rain before the body had been placed at the dump site? Was it even related?